The R2S (Rapid Response Spacecraft), also known as UND-Sat (University of North Dakota Satellite), is an 1U CubeSat mission developed at the John D. Odegard School of Aerospace Sciences at the University of North Dakota to demonstrate the small form factor data collection capabilities required as part of a multi-cubesat assessment mission. 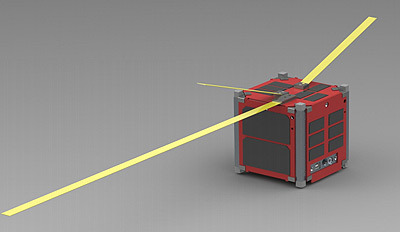 The assessor mission will involve an interplanetary craft that will deploy two cubesats in close proximity to the NEO. These sub-satellites will take different paths around the object, imaging it and characterizing its gravitation field. This will facilitate the determination of the object’s mass and composition. To meet the mission objectives, R2S incorporates two visible-light imagers, a GPS receiver, an inertial measurement unit, and a dedicated microprocessor to manage these instruments and process collected data. Visible Light Imagers. Two 4D Systems uCAM-II cameras will be mounted on adjacent faces of R2S (a separation angle of 90) to increase the likelihood of capturing useful images of the Earth. GPS Receiver. A Novatel OEM615 GPS receiver module (with COCOM limits removed) and a GPS antenna will be used to determine the current position of R2S. Inertial Measurement Unit (IMU). R2S will carry an InvenSense 6-axis gyroscope/accelerometer and a Honeywell 3-axis magnetometer to measure the relative orientation of the spacecraft over time. Payload Microprocessor. Distinct from the OBC, a dedicated SiM3U167-B-GQ microcontroller will be responsible for controlling cameras, selecting useful images, building image mosaics, performing super-resolution processing, and managing the GPS and IMU. Storage. The payload includes an Alliance Memory 32 Mbit SRAM used during image processing, and a Micro SD Card for storing processed images prior to downlink. Once it is released into low-Earth orbit, R2S will power up. deploy its communications antennas, and perform system checks. R2S will then capture images of the Earth. Position and attitude data, along with time stamps, will be stored with each image. Statistical analysis will be used to identify candidate images, and R2S will attempt to assemble usable images into a mosaic image. Super-resolution techniques will be employed to enhance the images, and the final images will be downlinked to either the UND or ISU ground station. R2S will also periodically communicate with multiple satellites in the Global Positioning System (GPS) to determine its location relative to these satellites, and report this information to the ground stations as a part of its system status. It was selected in 2012 by NASA to be launched as part of the ELaNa program. R2S (UND-Sat) - (via NASA ELaNa program) with ?